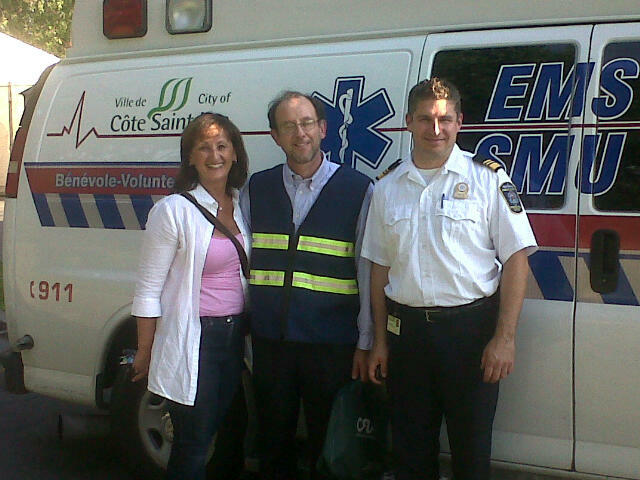 Cote Saint-Luc’s Public Safety volunteers – vCOP and EMS – have been very active throughout the last months. Here is a short report highlighting some of their activities. Smoke Detector Brigade 2015… a success! and as residents learn about this important service, we hope to increase our success rate in future years. detectors where they are missing. The year did not start well for a family on McMurray as fire ripped through the detached bungalow. Thankfully no one was home at the time, though it did take some time to reach the owner who was out of town. The fire department responded quickly and the area was protected by police, Public Security and vCOP, while EMS had a team on stand-by. Two more major house fires happened just a few days apart. A fire broke out just after dinner time on January 20 at a house on King Edward. Luckily, no one was home at the time as the house was being renovated. Flames and smoke could be seen from the outside and an astute taxi driver called 9-1-1 to report the fire, with our Public Security agent arriving a few minutes later. Our Public Security and EMS teams were on scene to secure the scene and provide assistance. Two EMS members attempted to resuscitate a cat that was found in the basement, unfortunately without success. Just before 5 AM on January 23, another fire broke out in a basement apartment on Westover Road. EMS and Urgences santé treated and transported one person, while the fire left one family homeless. They were taken care of by the Red Cross who arranged temporary lodging for the family. Côte Saint-Luc, Hampstead, Westmount, Outremont and DDO. Cote Saint-Luc’s Emergency Medical Service volunteers are always ready to respond to urgent calls for help anywhere in the city. With minimum training as First Responders, CSL EMS volunteers arrive on scene ahead of the Urgences Sante ambulance to quickly stabilize, reassure and comfort the patient. EMS answers some 3000 calls per year originating from 911. 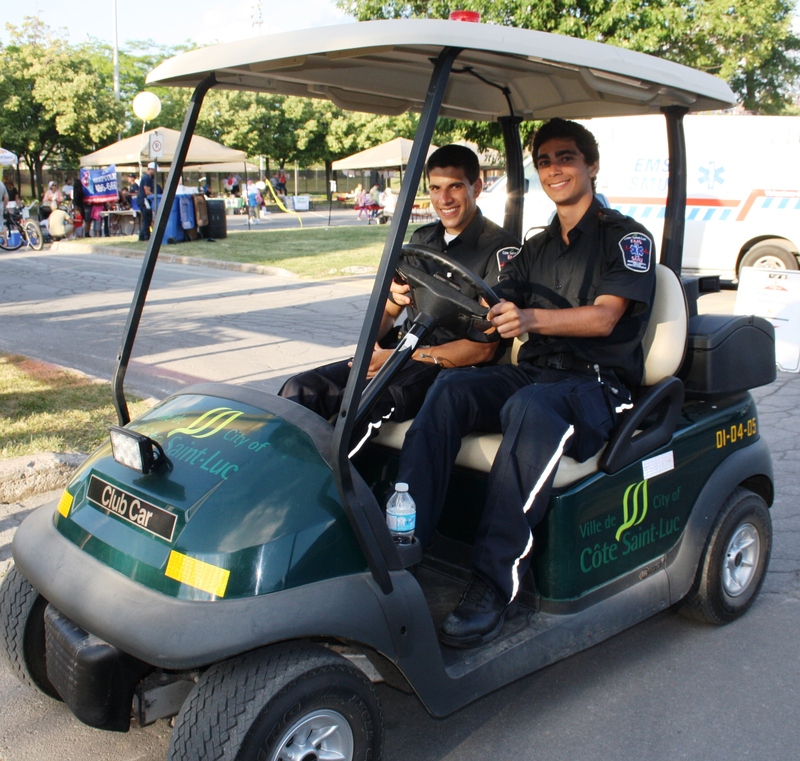 Pictured here are medics Isadore Friedman (left) and Benjamin Bouzo in an electric cart used at large community events. US Consul Ian Sheridan joins CSL EMS on an observer shift. Greeting the Consul are Councillor Ruth Kovac and Public Safety Chief Jerome Pontbriand. Cote Saint-Luc Emergency Medical Services are often on the minds of CEGEP and university students seeking to gain valuable hands-on experience in hopes of furthering a career in health care. Some 20 and 30 year-olds join for personal interest or to give back to their community. But never before did they do a ride-along with a member of the diplomatic corp.
Last evening, they were joined by United States Consul Ian Sheridan who expressed interest in learning more about the renowned First Responder Service when he first visited Cote Saint-Luc at the VE Day ceremony, last May. True to his word, the U.S. Consul booked a shift and joined medic Adam Gossack, a second year medical student, for several hours on the Cote Saint-Luc EMS ambulance. The Consul responded to an emergency call for serious hemorrhaging on MacDonald Avenue. Now that’s what I call “cross border cooperation”. Serge Tremblay, Director of the Service de sécurité incendie de Montréal (SIM), is pleased to announce that the ninth and last cohort of firefighter first responders will be ready for service starting December 7, 2009, in the boroughs of Côte-des-Neiges–Notre-Dame-de-Grâce and Ville-Marie. This step marks the end of the implementation of this service throughout the territory of the Montréal Agglomeration. The new firefighter first responders will be working at Station 4 (5260, rue Van Horne), Station 27 (5353, rue Gatineau), Station 34 (5369, chemin de la Côte-Saint-Antoine) and Station 46 (4760, avenue Cumberland) in the borough of Côte-des-Neiges–Notre-Dame-de-Grâce; Station 10 (1445, rue Saint-Mathieu) and Station 25 (1212, rue Drummond) in the borough of Ville-Marie as well as Station 78 (6815, chemin de la Côte-Saint-Luc) in the City of Côte Saint-Luc. Starting December 7, all fire stations within the Agglomeration will be offering medical first responder service. All residents on the island of Montréal will be able to benefit from this service. “The fast response of firefighter first responders in critical emergency situations can make all the difference, because in such situations, every second counts. On the strength of the introduction of eight other cohorts of medical first responders since 2007, we have the confirmation that this service meets the needs of the population and that its beneficial impact was well worth the efforts invested,” added Mr. Tremblay. Operating as a complement to Urgences-santé crews, firefighter first responders stabilize the victims’ condition while awaiting more advanced medical care from paramedics. Their response to victims in critical emergencies helps save lives and reduces potential damage. Once the medical first responder service has been completely phased-in on the territory of the Montréal Agglomeration, this will mark a transformation in the entire pre-hospital services sector in Greater Montréal. Montrealers should get used to seeing fire trucks come calling when there is no fire, but a medical emergency. That was the main message yesterday from a top-ranking fire department official as all of Montreal Island’s 65 fire stations became staffed with qualified first responders – firefighters with enough medical training to help people in distress make it until an ambulance arrives. Richard Liebmann, chief of the fire department’s first responders division, said 1,700 of the island’s 2,300 firefighters had received the 62 hours of training to be first responders as of yesterday. The latest graduates are in fire stations 4, 27, 34 and 46 in Côte des Neiges/Notre Dame de Grâce borough and in stations 10 and 25 in western downtown, he said. There are now at least two first responders per station per shift. The first responders now respond to all priority one calls – including when a person is in cardiac arrest, is not breathing or has had a severe allergic reaction, he said. Ambulances are also called for those cases, and both may arrive at the scene. But there is little redundancy because ambulances typically aren’t available as quickly. “We get there more than a minute before ambulances in 90.6 per cent of the cases,” he said. Ambulance technicians’ jobs are more time consuming, involving more advanced levels of care, transporting the patient to a hospital and transferring the patient to the hospital’s care. First responders sent to a medical emergency do not transport patients, Liebmann said. They are also ready and equipped to go and fight a fire if called to one, he added. In my opinion: It must be emphasized that the firefighter first responders will not answer emergency medical calls in the City of Cote Saint-Luc. This is the sole responsibility of the Cote Saint-Luc Emergency Medical Services. Also to note, Montreal firefighters will only respond to Priority 1 medical emergencies when the crew in station is available. EMS responds to Priority 1 as well as Priority 2 medical emergencies and can often answer two, three and even four simultaneous emergency calls thanks to its numerous volunteers who remain on call round the clock. CTV News Montreal report on roll out of Montreal first responder service in West Island and fight to save EMS (Councillor Glenn J. Nashen and EMS Director Stephan Kallos interviewed). Côte St. Luc’s volunteer Emergency Medical Services department has been given a year’s grace to continue answering Priority 1, extreme emergency calls, The Suburban learned Monday. A Quebec law established the Montreal fire department would take over the first responder services in phases, with EMS the last to give up Priority 1 on Dec. 31, 2008, but according to D’Arcy McGee MNA Lawrence Bergman, the EMS now has until Jan. 1, 2010. Bergman, who is Quebec revenue minister, revealed the news of the extension when The Suburban questioned him about petitions presented in his riding by Côte St. Lucers to preserve the Priority 1 service. “I don’t want to take the credit for it,” Bergman said Monday. “It gives time to make presentations in the coming months. But for the moment, EMS remains in the community until Jan. 1, 2010.” He said the extension was granted through an administrative decision. On Monday night, Côte St. Luc council received petitions, to be passed on to Bergman, from residents of St. Patrick Square and B’nai Brith House. Names were also collected at Manoir Montefiore, the Eleanor London Library and the Delly Boys restaurant. Councillor Glenn Nashen, in charge of security matters on council, said the extension is not enough. “It’s not what we’re looking for,” he said. “It’s better to have a one-year extension than not to have it, but ultimately what we’re seeking is a permanent exemption. B’nai Brith House resident Seena Aber said EMS is a “very necessary service. Yetta Novak, also from B’nai Brith House, said EMS arrived to help her in three minutes, while Urgences Santé arrived 30 minutes later. “EMS is very important,” she said. The other major issue for Côte St. Luc is the structure of the agglomeration council, set up by the Quebec government and considered unfair by the suburbs for allowing Montreal to pass what it wants, even at the suburbs’ expense. Bergman said the issue has been greatly discussed between the mayors, and the municipal affairs minister, “and discussions continue.” Asked about the ADQ’s promise to abolish the agglomeration council, Bergman said the party’s position changes “every six months. Councillor Dida Berku said a pressure campaign during an election period in general is a good idea. Berku said she has spoken to Bergman “repeatedly” about the Cavendish extension issue. She and council want the extension planning process sped up, and she wants the railways to pay full tax, rather than the 40 percent tax they have been paying for more than a decade, to help pay the estimated $100 million cost. The extension would cross railway property. Other communities are taking a wait-and-see approach to collectively pressure the government on issues like the agglomeration council. In Hampstead, Mayor William Steinberg said he will not take a position regarding the provincial election yet, but that he may do so before election day. But he added that individual voters can apply their own pressure. “I do encourage voters to write, fax, e-mail and/or speak to the candidates and party leaders about the agglomeration issue,” he said. In Montreal West, Mayor Campbell Stuart recently announced his support for the ADQ, because of its promise to dismantle the agglomeration council. Stuart said his support for the party represents his pressure campaign, and that Montreal West as a town does not have any specific plans as yet for a pressure effort.